From its inception in 2008 one of the Center for the Physics of Living Cells’ mission objectives is to catalyze new collaborative research directions sharply focused on the best opportunities for major technical advances. Working toward fulfill this mission goal, CPLC biological physicists Taekjip Ha and Yann Chemla have combined two cutting-edge laboratory techniques that together directly get at the structure-function relationship in proteins. Ha is well recognized for his innovative single molecule fluorescence microscopy and spectroscopy techniques. Professor Yann Chemla is a top expert in optical trapping techniques. Their combined method—simultaneous fluorescence microscopy and optical trapping—yields far more definitive answers to questions relating structure to function than either technique could independently. Working in collaboration, Ha and Chemla each applied the above techniques in their laboratories, with conclusive results. The findings of these experiments have been published in two separate articles in the April 17 issue of the journal Science, “Direct observation of structure-function relationship in a nucleic acid–processing enzyme” and “Engineering of a superhelicase through conformational control”. The full article is available at my.physics.edu. 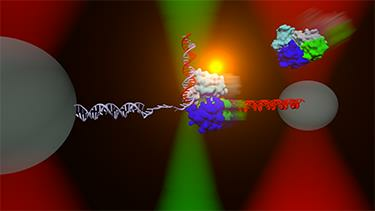 Daily Illini article on "New potential found with helicase discovery"